Other than being a cool looking guitar, it has an important role in playing and tuning. Tuning: We all know that feeling of a floppy string followed by a muddy tone when it comes to low tuning. Having a long scale allows you to use your standard string gauges instead of a 1/4 inch cable and still achieve a tight tone without losing tension. Playability: The differences between the longer and the shorter scales create the fan frets angles which allow your hand to rest in its natural position on the fretboard, without the need of stretching those tiny fingers all over the F board. The Perpendicular fret is between 8-9th so you’ll get full access to all the frets without the need to stretch out your Yoga exercises all over the fretboard. Intonation: nothing to do with it! Every instrument should be set to the right intonation regardless of how it is built (fan fret or not). Hardware: I use the Bare-knuckle slanted pickups with a 10 degrees angle on the base plate. 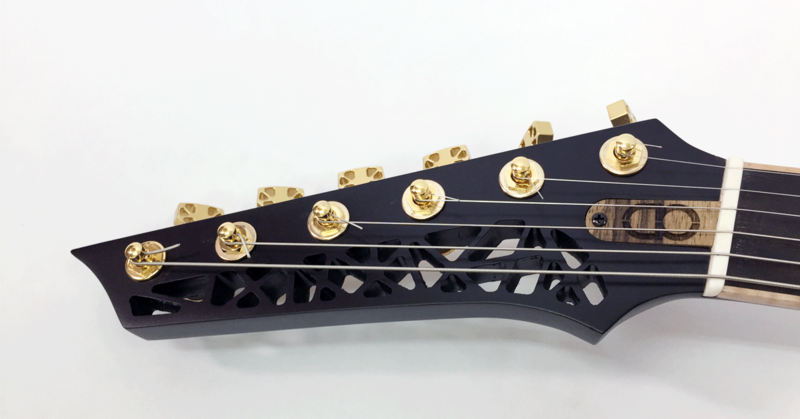 Single string bridge by ABM – that way, I can adjust the position of each string in the best manner. The ABM is known for a comfortable bridge when you palm mute or just rest your hand on it. Tonal Characteristics: Expressed mids and more bite on the bass side. Tonal characteristics: More open and acoustic tones only on the clean sound, it won’t give you any feedbacks with high gain. Strengthen the headstock (especially if you are doing a floating bridge build). I use Mahogany, Ash, Ebony, Maple, Maple Black Limba(Corina), Zebrano, Ziricote, pale moon Ebony, burl Maple, walnut, burl walnut, wenge. If there is something specific you are looking for, I will hear you out and let you know if I can get it or willing to use it. Every wood I’ll use has to be dried well before turning it into a guitar, therefore I might not agree to use wood that is not ready to use. Body: 40mm thick for all models – that’s 34mm body+6mm solid top. 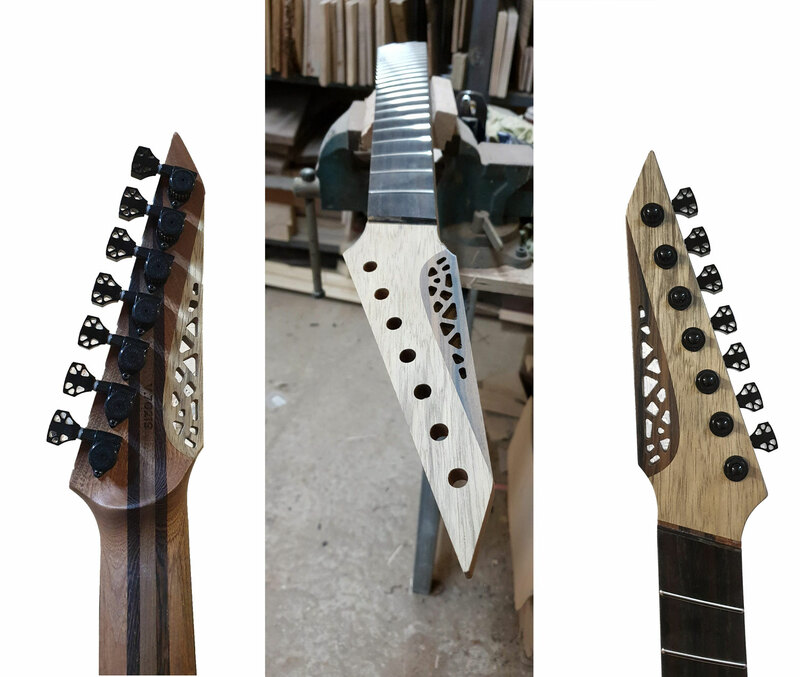 Neck profile: 19mm at the first fret and 20.5mm at the 20th fret, or else if requested. Almost everyone is looking for the strongest neck, I have to say that’s a mistake. That will probably be a stable neck and won’t lose tuning so much, but you’ll probably end up with a dead instrument. A neck should vibrate in collaboration with the strings frequencies, the neck comprises 70% of the sound. I build the necks from booked match stabilized woods with one truss rod and no carbon fiber reinforcements. I want to allow the neck to vibrate and react to the strings in the best possible way. That is the reason why I’ll never build an extended upper horn, that will just kill the bass side of the neck. Construction method: I do only set necks since I believe it’s the best way of connecting wood and making them work together without losing the sound in different materials. You can ask for other thicknesses if you like. Made from Ebony or Maple, Sometimes other exotic woods. Fretboard blind fret slots are standard for an OD guitar, why? because you deserve a comfortable neck in your hand, a fretboard with blind fret slots keeps the fret ends inside the wood. If you have read what I wrote on tonewood, then you must know by now that wood moves and changes over the years, that can cause the frets to pop out from the sides and cut your gentle hands, we don’t want that 😉 Also, it looks better than a fretboard with fret ends on its sides. I use only Switch-Craft for switches, it lasts longer than anything else out there. 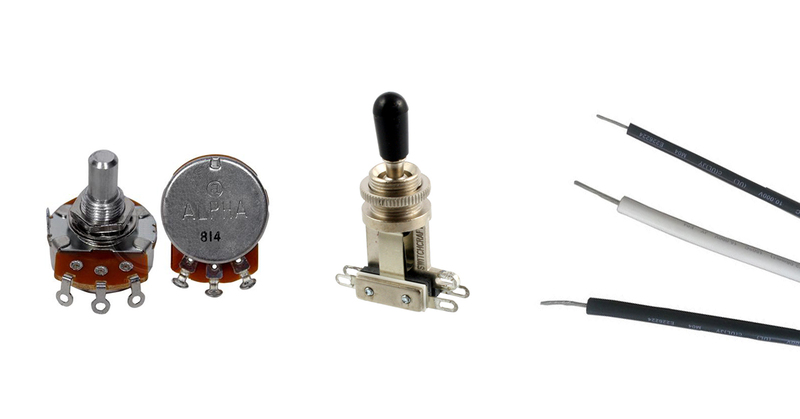 Alpha for potentiometers – same reason. I found some capacitor that works best for tone, it has a wider spectrum than everything else and does not eat your tone! Everything is shielded, even if it’s 2 hum-backers configuration. Pickups: Bare knuckles, other brands are available at extra cost. Tuners buttons: I make my own buttons – its crafted out of aluminum and anodized in black or gold. these buttons weight less than 10 gr for a set of 7! (regular buttons weighs almost 80 gr). It doesn’t break strings, it rings better than everything else I’ve tried. Don’t worry, I make sure our bone materials gets from animals that died naturally, not hunted or hurt for our needs. If you still don’t want to have animal material in your guitar, let us know, I have a nice replacement for it. Rhea has a slightly acoustic tone than the others, that is due to its unique headstock. 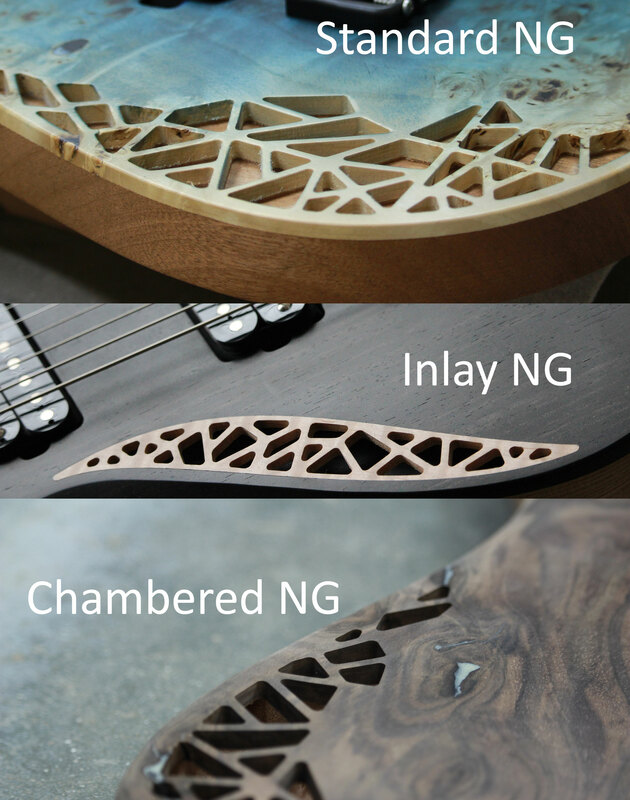 The Natural Geometric patterns act almost like acoustic headstock, it vibrates different than a regular solid headstock, giving it acoustic tone characteristics. IMPORTANT! 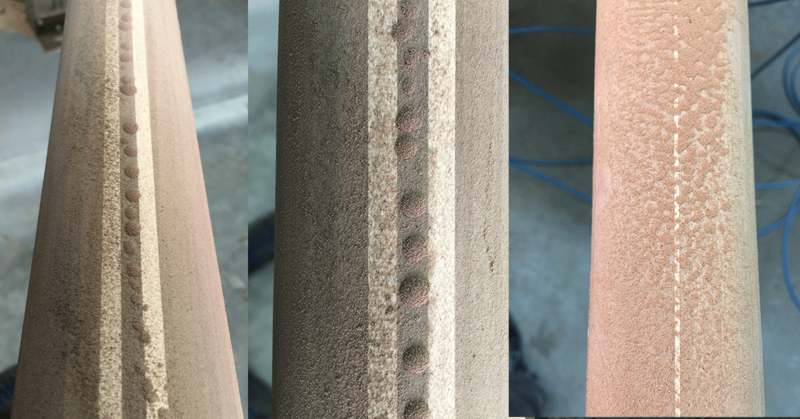 I spray coat only about 100 microns (0.0039Inch), that’s a very important method, we do not want to block the wood or seal it completely. 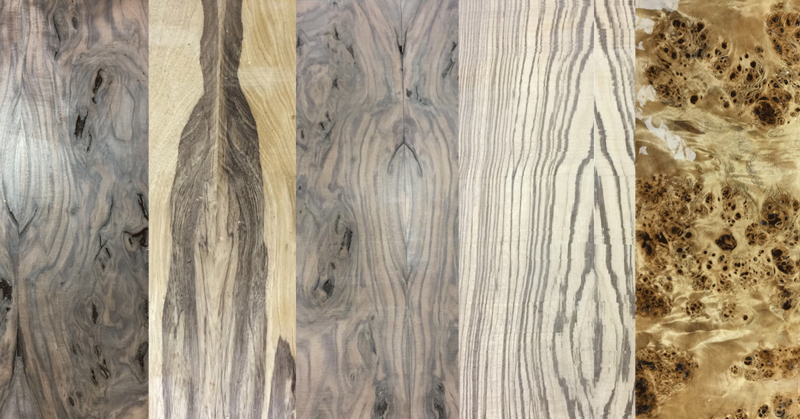 It must breathe over the years in order to resonate and use its full potential as a tone wood. 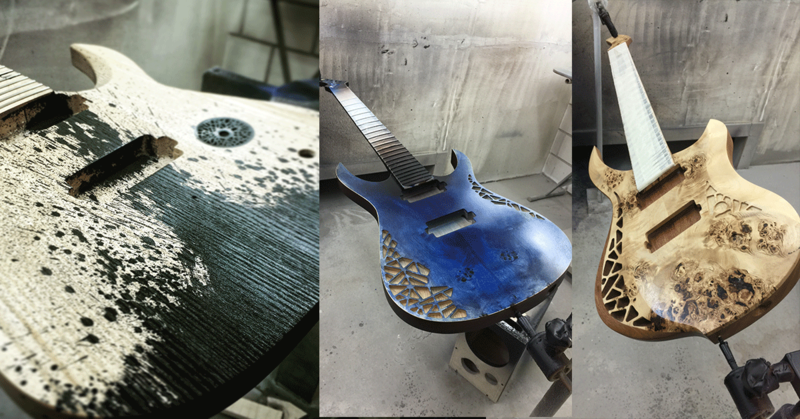 The finishing process is done by hand, we don’t have a robot which sprays a 1.5mm lacquer like in huge companies, there is a reason for that, once the lacquer is so thick, it’s easier to sand it down and finish the guitar faster, but the downside to it, is that the sound. Wood vibrates, if the lacquer is thick and soft, it will dampen the sound. If the lacquer is thin and hard, it will let the wood resonate as it should. Copies and replicas of other guitars – no, no …NO. 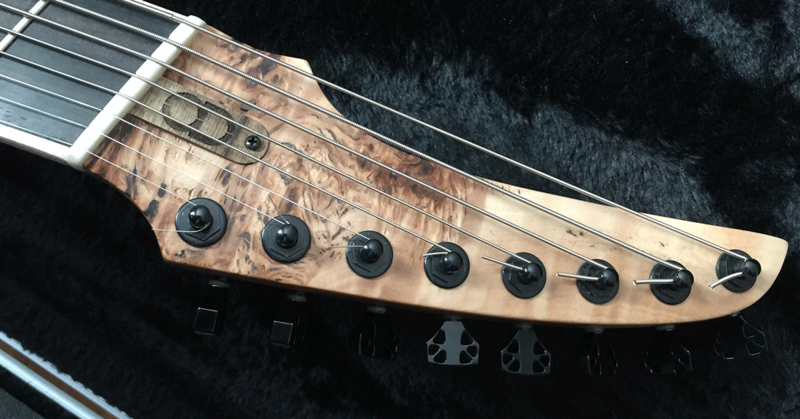 Ever-tune bridges: Not worth the loss of a good sounding guitar. “I’ll give you some parts I have, can you give me a discount?” – Mmm nope. “Will you send me a guitar for no reason?” Will you send me money for no reason? Extended upper horn – See my opinion on that in the neck section.